Many a King and Prince will never have worn a crown in this life so glorious as the one that awaits St. Monica in heaven. Never thought about this; Augustine ain’t a big hit with the EO (had an EO friend who thought Augustine was when the West “went bad”) so it makes sense. Btw, the EO website you link has a Church timeline is flat-out hysterical…worth a look. I think about Saint Monica a lot (or at least try to). She and I have different temperaments, but she is one to look up to and at least try to emulate. I think of her often when I read how strong a woman is for leaving her husband and I marvel at the strength that is necessary to stay. Apparently Saint Monica nearly became an alcoholic when she was a child and one of their slaves commented on this. It shamed her so that it is thought this may have been the beginning of her severity. She sounds choleric, so perhaps this severity was Grace from God. Thank you for this. 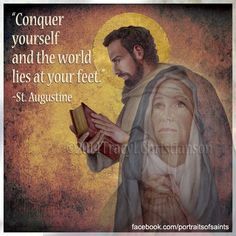 Augustine’s Confessions had a huge part in my conversion process and my choice of the Catholic church in particular (which later research and experience confirmed as my home, but I credit it to Augustine just the same). Despite that, and the fact that I took Monica as my confirmation name, I knew little more about her than what is written in Confessions. This taught me a lot, and I look forward to learning more about this mother and wife, as I seek to emulate her example with my own irascible and unbelieving husband. You’re welcome. Here is a Novena to Saint Monica for you. Hey, this is really beautiful, thanks for sharing.